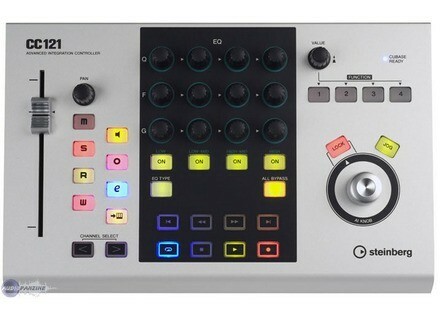 CC121, Motorized MIDI Control Surface from Steinberg. sw80's review"Time to get rid of our mouse Cubase Users!" The CC121 by Steinberg is a USB control interface for Cubase that will sync right up so fast it will make your head spin. There really is no installation involved besides the drivers if needed. I have been using this interface for 2 years now , and I use it as much as possible whenever it is around. The CC121 is very well built that’s why it cost a little more than other similar units. It is made out of stronger metal and it is a heavier unit than expected. It has 26 soft keys and 4 assignable ones, 15 knobs, 1 fader and connects to your computer through USB. This control interface is truly Cubase Ready. Don’t waste your time getting this if you are not a Cubase user and have understand of how Cubase works. Each DAW has devices like this so you will need to find one that will suit you. But if you are a Cubase user and Lover like I am then this is a must buy. The touch fader is very accurate and smooth. If you want to have your EQ in Cubase controlled externally then the CC121 can take that task one and do it great. This will pretty much let Cubase users get completely rid of the mouse. It is just so much easier using this then it was grabbing the mouse every time for such basic functions. I am happy that I chose to use this control interface. It has lasted this long and I don’t see it every stop working on me because of how well it is built. I have tried several different types of control interfaces with Cubase. Some made for Cubase and some not, but the CC121 has beat out any other one that I have used or tried. It truly is a gem for any Cubase user. Great quality and speeds up your work flow. Throw your mouse away! 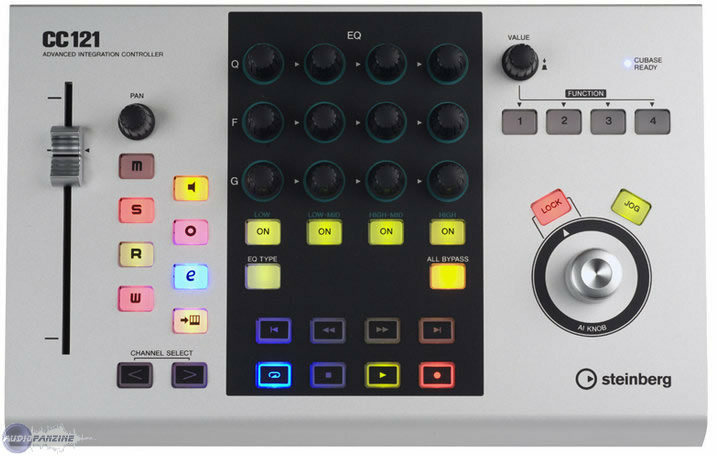 joelllb's review (This content has been automatically translated from French)" Excellent complete controller for Cubase"
I bought this controller there about a week and I use it with Cubase Artist 7.5. I was looking for a full controller in recent years which has several controls: transportation, EQ, the channel portion with a fader and the jog. Here everything is and falls easily to hand. AI KNOB can be used in different ways either JOG where you can set the type of JOG shuttle or scrub either control a specific parameter for VST version> 2.0 In general, any VST using the scroll wheel on your mouse to change the value of a potentiometer can be assignable. The fader is accurate and it is possible to adjust the sensitivity of touch. The equalizer knobs are notched but still allow enough finely adjust the settings. Note that since the 1.6 update these potentiometers are used to adjust the level of SEND effects by pressing and ALL TYPE EQ BYPASS. When support simultaneously EQ TYPE and the desired EQ it reverses the dB value that you configured buttons ON the slice. If you were to +12 dB -12 dB so you'll immediately. You can use it with or without external power supply provided that allows to have the motorized fader. You can set functions at will for the 4 function buttons located on the right. Potentiometer VALUE can either adjust the MAIN MIX the level of the metronome. When you press the knob you can either cut the metronome or mute the MAIN MIX. Overall it is very comprehensive and it works immediately on Cubase. I have always worked in Cubase so I can not tell you what happens on other sequencers. The classic channel set part and enables the recording of selected channel to solo, mute etc ... Note that when you press both buttons CHANNEL SELECT at the same time it opens or closes a file multiple tracks , this is a VST folder tracks or track type directory. Note that the faders VST, for example when using a VST type Addictive Drums outgoing multi-channel, fader controller can completely control the level of these virtual tracks. It is thus not limited only to the actual tracks. Overall therefore it is very comprehensive and for the price I paid (160 € used) it was absolutely unbeatable. The price / quality ratio is good I find even if Steinberg could sell below € 300 new. Listed manufacturing quality is at the top, you have a controller that weighs his weight with a thick aluminum panel and the rest is made with a thick, sturdy metal casing. Yamaha is producing the hardware is made in Japan which it's tough. I use it for about a year. I have not tried other models before. It is my opinion of good hardware though a bit expensive. IMMEDIATELY recognized cubase 5, config super simple. CASC was all possible parameters of a track in Cubase, including a motorized potentiomtre for volume. That said, I do not use it anymore because too noisy, and often when changing track volume pot jumps in all directions, do not have their hands on it. It's not very practical but I think some people like a. And food specially for this slider is really horrible, impractical and Plutt looks fragile. For me, the fader is motorized gadget. I'm volumes mouse is more specific on. I prefer the big round button that takes the place of the mouse wheel and can be locked on a function such as the reverb level of lead vocals, or the speed of the scraper trmolo or a band of four finally what we want and a fawn very simple. It's really good. It is also our four assignable buttons any function (well, APRS update usb driver, firmware and even cubase). But it works well. Using it, we quickly forget the keyboard and mouse are working right hand, left hand and CC121 going very fast. BMOL even when small: it is better to cut the module to boot XP because the computer might not Get You Started all. Switch CC121 XP once launched and then Cubase and roll alone. The quality-price ratio? bin a bit expensive but good quality except the fader in metal hull, pretty LEDs, nice stuff. Not having tried other controllers, I can not really compare but I like it and I am a hard spare. Not many models tried before separate MCU and M-Audio Project Mix. OK, despite what you read everywhere! It is a very good product, good quality and very easy to use. It costs a little more expensive, but it's really good quality. and it takes a max.